I love to write!! 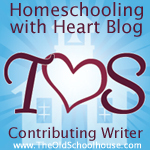 As a busy homeschooling mom, some days I need to write! Initially I took up blogging as an outlet to share my many words. I have been amazed at the time and energy it has taken to keep up with technology. I may participate in advertisements or promote a product in an effort to help offset the cost of my writing habit. Any post with an affiliate link will be clearly stated. Any product I review or promote will be with my true opinion. I will only promote products I have personally used and would not hesitate to recommend. Your privacy is important to me! By subscribing to emails, through this website or social media pages, you consent to receive new post updates. I only have access to collect information that you voluntarily give me via email, through the use of internet cookies, or another direct connection with you. I will not sell or transfer this information to anyone.